Calling Beijing’s restrictive framework ‘political reform’ is a misnomer. In a bid to convince the international audience that Beijing’s framework for electoral change in Hong Kong is progressive, Hong Kong Chief Executive C.Y. Leung wrote an op-ed that was published recently in various English and Chinese media. The chief executive hails the election of the city’s political chief by universal suffrage in 2017 as “major democratic progress,” asserting that a rejection of the political reform will be “two steps back” for Hong Kong. But make no mistake about it: to call Beijing’s restrictive framework “political reform” would be a misnomer. Indeed, as Leung maintains, Beijing has granted Hong Kong’s people a chance to select their political leader in 2017 through a one-man-one-vote system. This sounds like genuine democratic progress, until we examine the details. Hong Kong’s chief executives have always been chosen by an electoral college dominated by pro-Beijing elites. In 1996, however, a candidate only had to obtain the endorsement of 50 members from the 400-member election committee to run in the election. Back then, a total of eight candidates sought to get nominated, and three eventually vied for the office of Hong Kong’s first chief executive. In the last chief executive election in 2012, three candidates, including a democrat, contested the position after obtaining the support of at least 150 members of the 1,200-member election committee. The incumbent Leung eventually won the race with 689 votes. However, under Beijing’s conservative framework rolled out on August 31 this year, a candidate would have to clear a far higher hurdle to stand in the 2017 chief executive election. According to the decision by China’s rubber-stamp legislature, the National People’s Congress, a candidate running for office has to be endorsed by more than half of the members in the 1,200 nominating committee, to be modeled after the existing election committee made up of mostly Beijing loyalists. This high nomination threshold effectively rules out any possibility that a democrat or a candidate not approved by Beijing may have in contesting the 2017 election, ensuring that the five million eligible voters in Hong Kong would only get to choose among two to three pre-vetted candidates. While pro-Beijing voices point out that the proposed changes will drastically increase the number of voters who may select their future leaders, the fact is that Beijing’s restrictive framework is very similar to Iran’s state-managed democracy. One can hardly describe the introduction of Iranian style democracy into Hong Kong 17 years after its return to China as a sign of progress. That is why, contrary to what Leung claims, people in Hong Kong who want real democracy would opt for stagnation in maintaining the status quo rather than taking “two steps back” in accepting the universal suffrage Beijing has offered. To entice people to accept the constitutional changes, the chief executive dangles another carrot: voters would also get to elect all lawmakers through universal suffrage in 2020, if Beijing’s framework for the 2017 chief executive election gains passage in the Hong Kong legislature. This is in light of Hong Kong’s constitution, the Basic Law, which stipulates that reform of elections for the chief executive position has to precede that of the Legislative Council election. Currently, only half of the city’s legislators are chosen by direct election. However, now that Beijing has unveiled its diminished form of universal suffrage for the chief executive election, this may turn out to be yet another carrot attached to a stick. 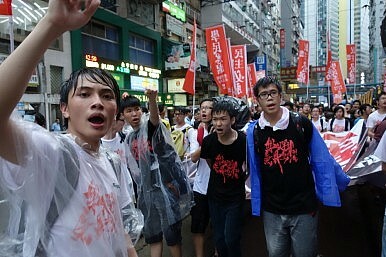 Since Beijing has already ruled out the direct election of the chief executive without prior vetting, it follows that it shall next seek to tighten its control over the Hong Kong legislature by reducing the seats of pro-democracy lawmakers to less than one-third, so that they can no longer veto important government bills, including all proposed electoral changes. In other words, allowing all lawmakers to be directly elected in 2020 does not serve Beijing’s interests, and thus it is likely to remain out of reach to the Hong Kong voter. Domestically, Leung’s administration has embarked on a campaign to urge Hong Kongers to seize their right to vote granted by Beijing. If Beijing’s decision is accepted first, incremental amendments to the electoral method may come later. Yet Hong Kong’s people have good reason to be wary of such exhortations. One Hong Kong official unwittingly brought home the perils of subscribing to Beijing’s proposal. Fanny Law of Leung’s de facto cabinet opined that a popularly elected chief executive under Beijing’s framework should be empowered to carry out his mandate without having to seek approval from the legislature. This undermining of checks and balances is precisely why Hong Kong people should staunchly reject the proposed form of election wrapped in universal suffrage. A chief executive who takes office in this manner may act on the pretext of a popular mandate to steam ahead with controversial policies like the notorious Anti-Subversion Law, Article 23. Should this happen, the liberties that Hong Kongers cherish could be further eroded. Having said this, Hong Kongers’ quest for real democracy is not simply about freedoms and rights, but also about issues of livelihood. The dominance of pro-Beijing businessmen and real estate developers in the legislature and the existing electoral college is at the root of many long-standing problems in Hong Kong, such as an acute housing shortage, spiralling property prices, a yawning wealth gap, and the perception of government-business collusion. A chief executive candidate who has to gain the support of this same group of rich and powerful elites in order to run in the election cannot possibly have the political will to implement policies that may benefit the people, but harm the interests of his backers. Kin-ming Kwong is a public policy consultant in Hong Kong and Chiew Ping Yew is a researcher with the East Asian Institute in Singapore. They are analysts of Hong Kong politics.